Juniors is your one-stop-shop for roofing, siding, soffit and fascia products and accessories. We have the brands you can trust and the service you need to get the job done. Whether you are a do-it-yourself enthusiast or a professional contractor or re-modeler, Junior’s Building Materials can help you with your roofing and siding needs. 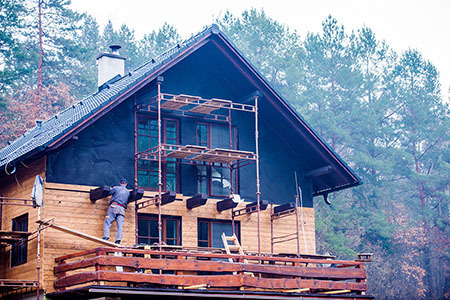 We carry a large variety of roofing and siding products that can take care of a small repair or roofing and siding your entire new family home. We carry Tamko shingles for all of your roofing needs. Fiber cement sidings are one of the best products to be introduced to the building industry in the past twenty years. James Hardie has been the industry leader since it’s inception and is our featured siding product. We stock pre-primed sidings in many styles and will be happy to order Hardie’s great Colorplus siding products for you. With a great warranty and durability, you can’t go wrong with Hardie! We also carry CertainTeed Fibercement & Cemplank siding for more budget-conscious options. And you can do a complete exterior job with Hardie trim, soffit, and panels. If you are looking to make a repair or a room addition to your quality older home, Junior’s carries LP SmartSide sidings in the three most popular styles used in the Chattanooga area in the last 30 years as well as 8” bevel cedar siding, another past time favorite. Come by Junior’s, just outside of Chattanooga, in Ringgold, GA, and check out our selection and competitive prices. We stand by our motto that we will come through for you!